A conversation today with one of our receivables financing companies reminded me of just how much knowledge we have about that marketplace, and how we tend to take a very analytical research based approach to comparing providers (rather than just basing decision on anecdotal evidence). 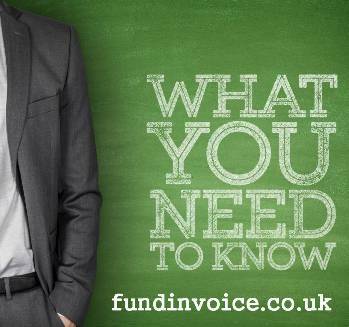 Much of our research you will find on this website, but both myself and my business partner have been involved with this sector since the late 80s, so a quick discussion can provide you with expert guidance about what you need to know about the receivables financing market in the UK. Below are a few of the key points that stood out as essential knowledge for anyone considering using these funding solutions. We have documented our research findings about pricing differences between providers. These can be significant e.g. 165% differences between the lowest cost and the highest cost for recourse factoring. Most of the invoice finance companies have a view on where they stand within the market, as regards pricing, but it is rarely based on statistical research. Many of the brokers will go to parties that they believe will give them well priced deals for customers that are cost conscious, but again - have they done the research? We have conducted both market research and mystery shopper exercises, in order to accurately gauge market pricing. We have made comparisons for different products such as factoring and invoice discounting, and we can use those finding to assist our customers. This kind of research would be seem to be an essential tool for any broker. There are a wide range of different product variations available on the market. These include different methods of operation regarding products that, on the surface, appear to be similar e.g. have similar names. For example, not all invoice finance companies are able to provide export services. Some of them make provisions that you can include a certain amount of export turnover within your domestic facility, however, many of the providers do not have the in-house language skills to be able to effectively collect debts due from foreign debtors. Conversely, some factoring companies provide specialist export services, so picking the right provider will be essential if you are thinking of entering export markets, and you need credit control support. There are a broad right range of other product variations, and different types of receivables finance available. Included within these is the selective invoice finance market. This appears a very straightforward product as customers are allowed to choose invoices to receive funding against - which can be a strong attraction. However, in practice, this could be a very expensive solution if you were looking for consistent cash flow from the facility. There are providers that can deliver full turnover solutions that may better suit your cash flow requirements. Also, there are a wide range of different approaches to charging minimum fees for such facilties. This is documented in my previous article about minimum fees, and the research that we conducted into this area. Once again, this kind of information would be essential to anyone thinking of taking up a receivables finance arrangement. Another clear difference between providers is their approach to taking risk. In some cases, they require first class receivables, but are prepared to accept prime movers who have poor credit history, others have more stringent requirements of the company directors. Other providers may be more tolerant of the quality of the debts, either based on including other security, or just taking a more relaxed view that can be more common amongst newer market entrants. Many of the deals that we see require some searching around in order to find providers that can help. We specialise in knowing who will deal with difficult sectors or particular issues. For instance, not everyone will take a relaxed view regarding the funding of RPO accounts for recruiters, and not everyone can is prepared to fund construction sector debts. We also continuously check the service levels of providers that we come across. We have undertaken comparisons, and once again, we can use these to guide clients that are concerned about receiving a first class service. As a receivables financing brokerage, we have a good grasp of what you need to know about receivables financing and the various options that are on the market. The differences between providers extends far beyond choosing according to price. Many users tend to discover this once they have already committed to a particular provider. Often this results in us helping them move to an alternative receivables financing company, that are better placed to deliver the kind of solution that they require. If we can help you find an appropriate provider we would be more than happy to assist you in any way that we can, and make our knowledge base available.